Regional favorites such as Water Maid® rice in the south and River® rice in the mid-central U.S. are the best selling brands of medium grain rice. Generations old recipes like traditional gumbo, jambalaya, and étouffée and rice pudding often call for the Water Maid® and River® Rice brands by name. 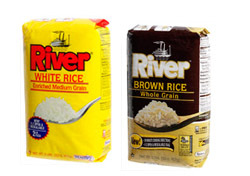 For a regular brown rice brand, try River® Natural Long Grain. Popular among America's health-conscious consumers, the nutty flavor and chewy texture of brown rice offer consumers a change of pace from the traditional health-food fare. Brown rice is a good source of whole grain fiber, is naturally sodium-free, high in complex carbohydrates, and high in vitamins and nutrients.